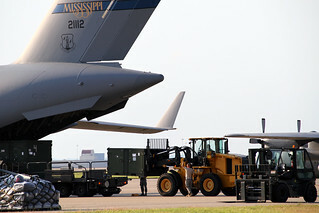 LOUISVILLE, Ky. (2OCT14)– More than 60 Airmen from the Kentucky Air National Guard will begin departing Thursday afternoon for Senegal to establish a cargo-processing hub in support of Operation United Assistance, the international effort to battle Ebola in West Africa (photo by Staff Sgt. Scott Raymond, Kentucky National Guard Public Affairs). LOUISVILLE, Ky. — More than 60 Airmen from the Kentucky Air National Guard deployed Oct. 2 to Senegal to establish a cargo-processing hub in support of Operation United Assistance, the international effort to battle Ebola in West Africa. Click here for more photos of this story. Kentucky’s Airmen departed aboard multiple aircraft along with all the equipment necessary to establish an Aerial Port of Debarkation at Léopold Sédar Senghor International Airport. The Aerial Port of Debarkation, or APOD, is designed to accept large quantities of cargo arriving on C-17 and C-5 aircraft, process the material for staging and then load it onto smaller aircraft for distribution into affected areas. The Kentucky Airmen assigned to the Louisville-based 123rd Contingency Response Group, will remain in place as long as the mission dictates. An advance team of eight Kentucky Air Guardsmen and one active-duty Airman arrived in Senegal on Sunday to assess the airfield and operational capabilities. “We know that this mission is not about us. The estimates that we’ve seen are somewhere between 500,000 and a million lives that could potentially be lost in this epidemic and that’s what we are going to stop that’s what we are going to be part of,” said Lt. Col. Matthew Groves, commander of Global Mobility Readiness Squadron of the 123rd Contingency Response Group. 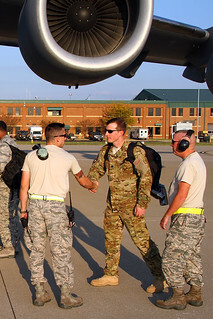 The 123rd Contingency Response Group is the only unit of its kind in the Air National Guard. Conceived as an “airbase in a box,” the group acts as an early responder in the event of contingency operations worldwide. Several members of the CRG were involved in previous humanitarian missions, to include Haiti earthquake aid in 2010. Its personnel have the training and equipment to deploy to remote sites, rapidly open a runway and establish airfield operations so cargo or troops can begin to flow into affected areas. Unit members represent a broad spectrum of specialties, including airfield security, ramp and cargo operations, aircraft maintenance, and command and control.